In this continuing series, I told you about having traveled to Colorado Springs with members of my family to join my firefighter brother at the memorial for the fallen firefighters of 2001, including the 343 who died at the World Trade Center. I introduced you to Lt. John P. Napolitano, through a letter written by his father in January of 2002, which had been displayed at the memorial. In the second article, I brought you a letter that John’s dad, John Napolitano, Sr., had written to me after he discovered a section of my website that discussed his son. Since then, we’ve taken a look at the world of a father who lost his son, and the emotions that have played a part in his life since then. 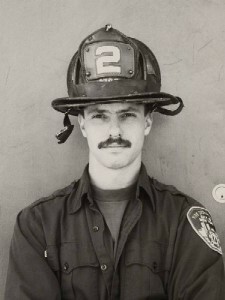 John Sr. calls the firefighters and policemen who died at the World Trade Center the first patriots of the 21st century. We’ve been with him as he recalled his son’s childhood years, into his career and the family that he loved so much. We’ve seen John Sr. remember his son on his birthday (coincidentally, this 1st patriot of the 21st century was born on the 4th of July), on Father’s Day, and during the holidays. With this article, John Sr. shares with us some memories from the Ground Zero memorials held on Sept. 11th, including a serendipitous meeting on more than one occasion with a friend of his son’s, and he discusses the anger he feels about the events of 9/11 (you will be surprised) and he tells us what he would say to those who condone or commit acts of hatred. I received this letter on Sept. 11, 2004. Hi Bill…thank you so much for your kind words, but especially for the place in your heart that you have reserved for him…and all the other Heroes. Today Lenny and I went to the “Site”, as we will every year. We held my son’s and his brothers’ pictures high above our heads, and listened to the names over the loudspeakers, waiting for our “guys” names to be said. We looked at all the other people and the smiling faces on the pictures that they held high, and they too were waiting for a “name” to be said loud, and just when I think that my heart cannot break any further, I look at all the sorrowful faces… and prove myself wrong. At the first anniversary as Lenny and I were walking in the crowd, Lenny called my attention to a Firefighter who had my son’s picture in his hat. He was tall and with his head high my son was elevated above everyone… I squeezed my way towards him, he was with his wife and both looked so sad, when I approached him I pointed at his hat and said…”thanks for carrying my Son”. He looked like all the air came out of him as he looked at me, and I grabbed him to hug him and he held me as tight as he could, and he broke down crying and he said to me…”Mr. Nap.. I loved him so much… I loved them all… but John…” I told him I understood, soon we were all crying, Lenny, me, the Firefighter, his wife. We all proceeded down the ramp to where the Towers once were to complete why we were there. This Firefighter had once been a member of the Lakeland Fire Dept and was a good friend of John’s, he followed John into the FDNY, having started in 1994, four years after John. After the ceremony I hugged him goodbye, and told him that I would see him next year. When next year came, even though it was very crowded, as Lenny and I were walking towards the ramp, an emotional day became more emotional as I again met up with my sons friend…we smiled… we hugged.. and then we cried.. and as I held him I said in his ear that it was OK to be sad today… but that John would want him the rest of the days to be happy.. to love his wife and kids as much as he could.. that this I know is what my son would want…. we went down the ramp, to be where we belonged, to be near those that we love, those that we will forever honor… and when it was time to go, we said our goodbyes, and I said.. “I’ll see you next year”. The World Trade Center site, is much more “sterile” now, but as Lenny and I walked with the crowd we both still see the “debris field”, we held pictures high for those to see the faces of Heroes, I think maybe to also share our heartache. I was approached by a New York TV News Team, I was asked if I have any anger.. without hesitation I said that “My anger is that, in this day and age, with all the spectacular things that Humankind can do, with all the goodness that is in us, that there are people that are filled with so much hate and rage at those that don’t think the way they do, or don’t pray the way they do, that they are willing to sacrifice themselves just to know that they killed and made them suffer.. them and their families.” To those people who would commit, or condone, acts of hatred, I say this.. that although the world saw on September 11, 2001 such an act of hate.. they also saw acts of Compassion, Professionalism, and Profound Courage, and it is these acts that the World at large will forever remember and embrace. The crowd was very thick this third anniversary, but not too far in front of me was a tall familiar Firefighter, I pointed him out too Lenny and got through the crowd to him, I came up beside him and put my hand on his shoulder, this time we hugged longer.. and cried longer.. Lenny caught up and we all slowly made our way down the ramp. I shook every hand of the British “Bobbies” that stood in Honor, and Thanked them for being there. I eventually stood at the footprints of the North Tower, I waited for my sons name…people were laying flowers and pictures where the Tower once stood.. I put my sons picture there, and I just stood there looking at him, trying to imagine what he was doing that day…how high up was he.. was he tired.. was he afraid..and when the steel crumpled, and he heard it coming towards him.. did he think of us and know how much we loved him. I heard my son’s name, and again for a moment…time stood still… I put a flower on my son’s picture.. “I’ll see you next year Son…I love you”. I said goodbye to my son’s friend he told me that he will be see me September 25th for the dedication to John (Editor’s note, the dedication was of a section of a roadway that now bears John Napolitano’s name), I said goodbye to his wife, and I told her that I know that she is taking good care of her husband, and that I admire her courage, she told me that her husband was looking for me and was asking Security if they could locate me…and that she was happy when I found them… I smiled at her and hugged her goodbye, I know that I will see him next year, and that I won’t have to plan on where to meet.. My Son will show me the way. Thank you Bill for remembering. The following are excerpts from a letter John Sr. wrote last year (2005) on Sept. 11. My Son..I love you so much. Today, September 11, I again went back to the World Trade Center.. not to search..but to mourn..and again Lenny is at my side to mourn also.. for you, and his brother.. photographs with smiling faces are held high, and below, faces are not smiling but filled with tears…I strain to hold your picture high…I want the world to see the face of a Hero.. “This is my Son…Please don’t forget Him”…I placed photos of your little girls next to yours for you to see.. for the World to see.. Today is so hard my Son…but I have to be there.. and today your sister is going to read aloud your name for all to hear.. I wonder if God will let you hear. Your sisters miss you so much. I listen as all the names are said aloud, their smiling faces held high.. every year I get to know them better…and I mourn for them also…and now I hear your sister’s voice, saying the names of those that you tried to save, and names of those that were also Heroes, and in a firm but fragile familiar voice.. I hear your name..and your sister tells the World how much she loves you.. and my Heart breaks.. and others are crying for their loved ones..and for you.. we are all becoming one big family…united in sorrow, bound together by grief. The World Trade Center is now a building site. but I still see the twisted steel, and smell the damp grey ash that was everywhere.. and I close my eyes, and write with my finger once again, on a wall covered with ash.. “Rescue 2 John Napolitano I am here and I love you Dad”.. and it ends…and we slowly leave, tired and drained and we know that we will be back next year. I love you Son and I miss you.. and next year for me is just a minute away.. because I see you every second of every minute of every day…and will do so till it is my time to be with you again..
You are forever in my heart my Son. My Son..I love you.. today is Christmas.. your favorite holiday.. you loved it so much because it gave you the opportunity to bring happiness to others. I just want you to know Son that you are still bringing us Happiness. All I have to do is close my eyes, and I see your smile. I can hear your laugh, and I can hear your voice…”Merry Christmas Dad”. The Guys at Lakeland still hang your Christmas Stocking, and I know that they always will. The days before Christmas they decorated the Fire Truck that carries your name with brightly lit Christmas lights, and with Lights blazing and the Siren screaming and “Santa” sitting on top, they drove through the neighborhood waving to all of those that stood outside their Homes. They slowly came down the street where you grew up, a street that also bears your name…”LT John P Napolitano Drive”. I stood outside and watched, and I remembered how whenever you could, how you used to be on that Truck smiling and waving, and how especially you loved the Children, and I closed my eyes and I remembered. The Rig stopped in front of the House, as they do every year. Santa waved..”Hello Mr. Nap,” and all the Firefighters disembarked, and in single file, walked up to the House, and up the stairs onto the front porch, and each and every one of them gave me a hug…They were hugging you my Son.. did you feel it? As they said their goodbyes, and walked back to the Rig, I saw you my Son that day in September, as you got off the Rescue 2 Rig with your “Brothers” and walked towards the Towers. I see you stop as you approach and look up at the dangerous and formidable task ahead of you, I know that you thought of all those poor people trapped, and that you would use all of your skills, and all of your Courage to save them.. and I know also my Son that you thought of us.. your Wife and your little Girls.. your Sisters, and your Mom.. and Me…this my Son I know. Christmas is a special time of year.. a Magical time.. and whether one believes in the true meaning of Christmas or not, its effects still seem to be felt.. I wonder why this is only for a day. You my Son carried the Spirit of Christmas with you each and every day, and I think also that if there was a way that you could somehow give a Christmas gift to the World, that it would be that each and every one us would carry with us always, for each and every day.. the Spirit of Christmas.. you would want this so that no one ever again has to look up and see the Horror of what you saw.. so that a Father doesn’t have to see his Son in the Shadows, and have to close his eyes to hear .. “Merry Christmas Dad”. You will be with me forever…till I see you again.. Merry Christmas my Son..